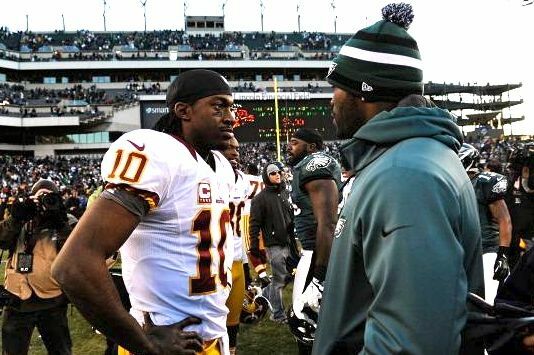 Redskins quarterback Robert Griffin III will try to lead Washington to its first playoff win in seven seasons when the Redskins (10-6) host the Seattle Seahawks (11-5) Sunday at FedEx Field. The game features Rookie of the Year candidates Griffin and Russell Wilson. Both quarterbacks are excellent passers and can run the ball exceptionally well. More importantly, Griffin led the Redskins from a 3-6 start to a 10-6 finish, while Wilson led Seattle to a four-game improvement from 2011. Griffin is getting a lot of publicity from the media and love from fans, and rightfully so. Griffin has led the Redskins to five more wins than they had last year, with help from rookie running back Alfred Morris, receiver Pierre Garçon and a host of veterans. Morris rushed for a Redskins record 1,613 yards in his rookie campaign. Morris also ran for 13 touchdowns, a Redskins rookie record. But lost in the excitement of the Redskins making the playoffs for just the fourth time in the last two decades is the fact that Griffin didn’t have a great game in the Redskins’ 28-18 win against Dallas last week. Griffin was less accurate than usual, finishing just 9 of 18 for 100 yards and no touchdown passes, though he did run one in for a score in the huge win that got the Redskins into the playoffs. To read the rest of my article, click here for Examiner.com and here for Bleacher Report.